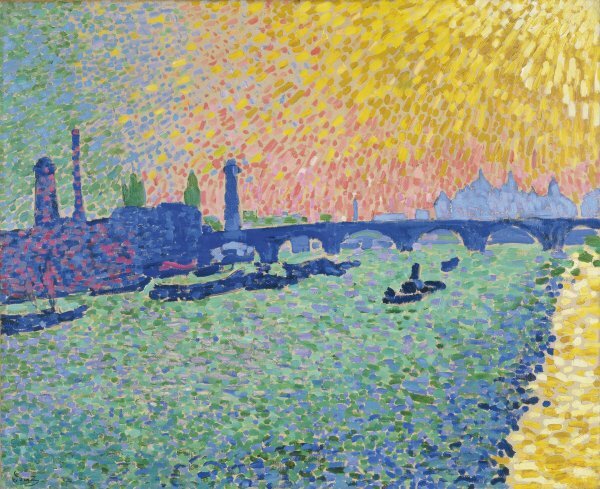 Waterloo Bridge is one of the series of canvases Derain painted in London for the art dealer Ambroise Vollard. Fascinated by the atmosphere of the British capital, the artist provided a Fauvist interpretation of the banks of the Thames, depicted earlier by Turner and Monet. In this work, the main pictorial motif is Waterloo Bridge as seen from the Victoria Embankment; the horizontal line of the bridge—painted in bright blue—serves as the horizon for the composition. The pointillist technique and the use of pure colours give the surface a mosaic-like appearance. The intense blues and bright yellows of Derain’s Collioure landscapes have given way here to colder tonal values, more appropriate to London’s climate, and the explosion of greens, blues and purples illustrates the Fauvist idea of the expressive violence of colour. 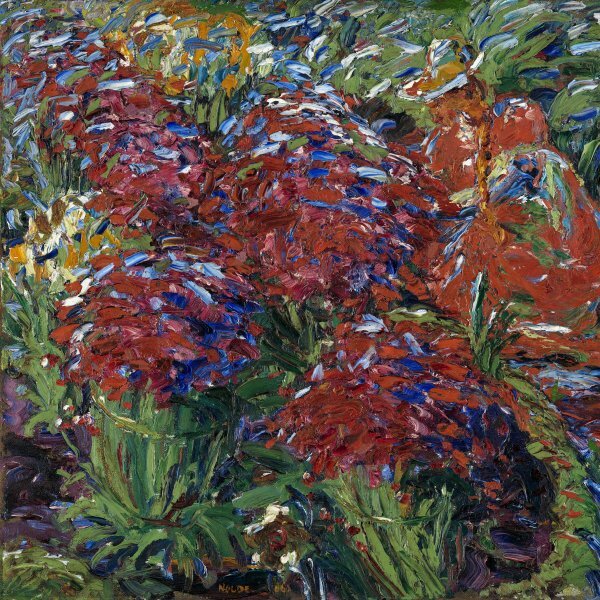 At the beginning of the twentieth century, the Fauves were the first to develop an innovative artistic movement as befitted the new era. Taking as a basis the legacy of the previous generation — the Impressionists and the Post-Impressionists — these provocative, modern-minded young “savages” shaped a new style of painting that paved the way for twentieth-century art. Although the themes they explored were similar to those of Impressionism, the Fauvist style placed new emphasis on colour, which went from being a means of capturing light and atmosphere to a manner of expressing emotions. Waterloo Bridge, a masterpiece from André Derain’s Fauvist period, belongs to a group of works painted in London, commissioned by Ambroise Vollard. The Parisian dealer, who had a keen interest in Derain’s work and had purchased his entire output in November 1905, sent the artist to London on three occasions between March 1906 and February 1907 to repeat Claude Monet’s earlier experience in his series on the river Thames, which was presented in Paris in 1904. Derain, enthralled by London’s atmosphere, painted thirty or so spectacular views of the banks of the Thames, producing a Fauvist rendering of the same subject matter, though far removed from Monet in both style and spirit. His manner of translating these views of London into an expressive explosion of colour is closer to Turner’s Venetian scenes than to Monet’s London paintings. On the advice of his friend Matisse, Derain had gone to see Turner’s pictures in the London museums, particularly his unfinished paintings such as The Thames above Waterloo Bridge and Norham Castle, which were shown for the first time at the Tate Gallery shortly before he arrived in the city. The painting in the Museo Thyssen-Bornemisza is a view of the old Waterloo Bridge from Victoria Embankment, featuring very blurred Houses of Parliament in the background on the right and the towering chimneys of the industrial buildings of Baltic Wharf on the south bank of the river on the left side of the painting. The legendary Houses of Parliament are not accorded the same prominence as in other paintings in the series; here the main motif is the bridge, painted bright blue, which serves as the horizon line of the composition.